Only available for residents of Quebec and Ontario. Welcome offer: Welcome offer: Get 6% cashback on gas and groceries for the first 3 months (maximum of $120 cashback). No maximum cashback cap. Redeem your cashback as soon as you earn $25. Purchase insurance and extended warranty. 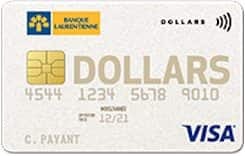 This CAD currency 82 is issued by Laurentian Bank and runs on the VISA Network. The purchase interest rate for this credit card is: 19.99 percent annually and the transfer balance interest rate is: 21.99% per year. Also the cash advance rate is: 21.99% per year. Travel cancelation is Not available for this credit card and also travel accidents are Not available.